On Thursday 10 January, the Leeds-Morecambe Community Rail Partnership formally marked the local involvement of both Arriva Rail North (Northern) and Carlisle Support Services for their part in promoting dementia awareness on the Bentham Line. Over the last six months Gerald Townson, CRP chairman, Rod Tickner, vice chair and Catherine Huddleston, the Bentham Line partnership officer, have been delivering sessions for staff to raise awareness of dementia and also enrol attendees as dementia friends. All three are Dementia Friends Champions, an initiative of the Alzheimer’s Society, which aims to give a positive approach that enables those with a dementia diagnosis to live well. 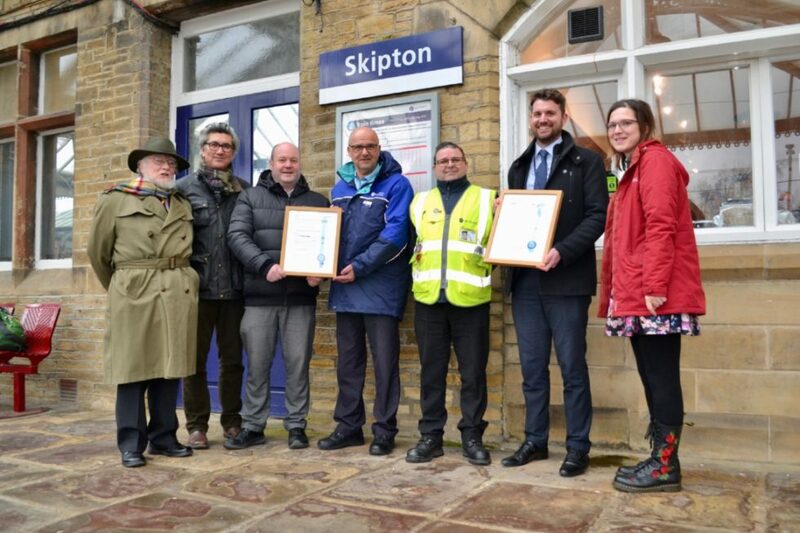 Gerald Townson, presented framed certificates to John Kitching, the Northern station manager in charge of ticket office staff at Shipley, Bingley, Keighley and Skipton stations and also Paul Kemp from Carlisle Support Services who provide gate-line and revenue-protection staff at the same stations. The certificates will be displayed in the work offices to reflect their staff’s keenness to be actively involved.